The Ellsworth Showdown has been popularly portrayed and discussed in books about Wyatt Earp. This illustration of the 1873 gunfight, by Lorence F. Bjorklund, was seen by only a few. Published in Enid Johnson’s 1956 book, Wyatt Earp, Gunfighting Marshal, the printing plate was destroyed and the book withdrawn from the market after Stuart Lake threatened a lawsuit against the publisher. Yet some copies had already been sold to the public, so the book still got out! 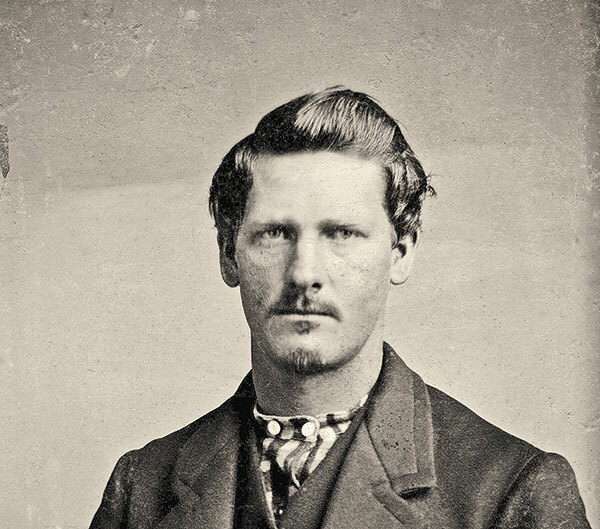 Among the many questionable incidents people often repeat about Wyatt Earp’s life story, few reveal the duplicity of his biographer as much as the tale of Wyatt’s 1873 showdown with Ben Thompson in Ellsworth, Kansas. Letters between Stuart N. Lake and a Hollywood producer show the legend makers of print and film collaborating to create a fictional character who both men insisted matched the real man. Stuart N. Lake first told the story of the Ellsworth incident in a 1930 Saturday Evening Post article. A wandering buffalo hunter searching for opportunities in the cattle business, Wyatt landed in Ellsworth on August 18, 1873, where he responded to a dangerous standoff after the killing of Sheriff Chauncey B. Whitney. Bill Thompson had shot Whitney and was allowed to ride out of town, while his brother Ben held off any pursuers with a shotgun. 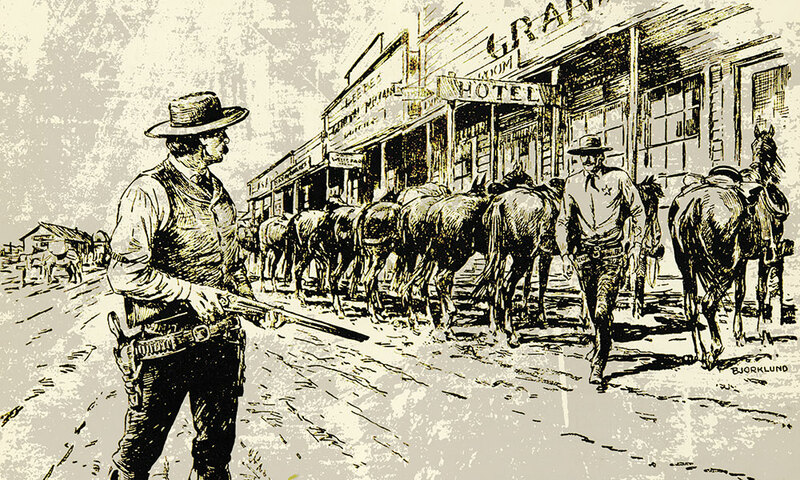 The remaining Ellsworth peace officers were too cowed to challenge Ben until Wyatt volunteered to arrest him, with the aid of two borrowed six-shooters and a sheriff’s badge. Striding fearlessly across the street, Wyatt ignored the “hundred or more half drunken cowboys” who backed Ben and intimidated Ben into surrendering. When offered a permanent position on the police force by the mayor, Wyatt contemptuously refused due to the court’s release of Ben on a $25 fine. 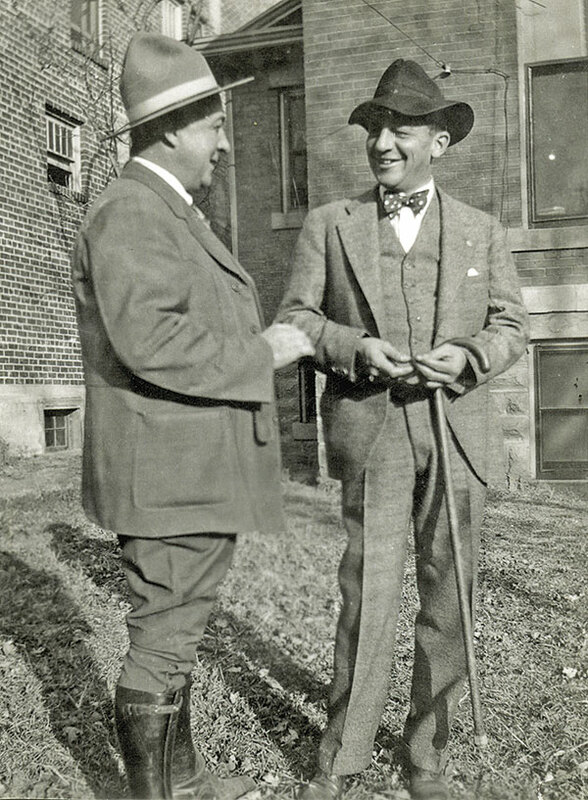 Wyatt Earp biographer Stuart Lake (above left) speaks with Merritt Beeson of Dodge City, Kansas, circa 1930. His face is more clearly shown in the photo below, among the few known photographs of Lake. Wyatt could have come up with his tall tale by reading the Ellsworth Reporter article. Wyatt enclosed a batch of unidentified newspaper clippings to Lake that year, and the Ellsworth story might have been among them. Regardless if Lake made up the story or repeated what Wyatt told him, the biographer left clues that suggest he realized he had stretched the truth. 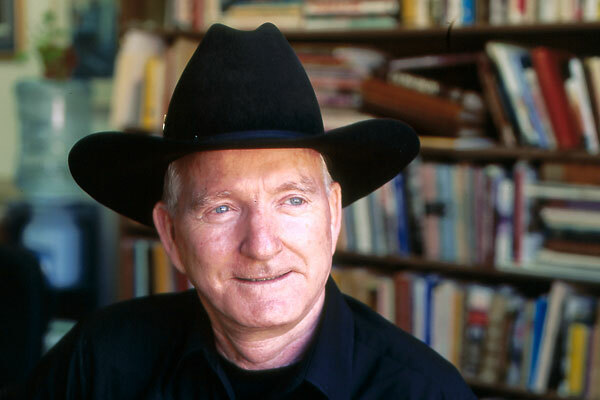 Lake embellished his Saturday Evening Post version of the Ellsworth incident by claiming “no more than a handful of the narrators of Earp history seem to have been aware” of the showdown, implying other accounts existed. In 1931, when Lake published his book Wyatt Earp: Frontier Marshal, he doubled down on his claim of available historical evidence by quoting the Ellsworth Reporter text verbatim, but he intentionally left off the concluding sentence that identified Hogue as the man who received Thompson’s guns. Lake couldn’t resist bragging that no other historians had been aware of the Thompson showdown, as opposed to the “handful” he had admitted previously. Both of his claims, however, set a trap to catch Lake in his lie by declaring the story’s roots could be independently verified. In the decades following his publication of Wyatt Earp: Frontier Marshal, Lake grew to consider his Wyatt character as his personal intellectual property. 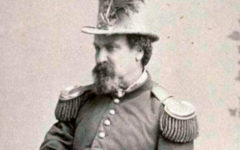 He often sought payment from any print or film depictions of Wyatt that he claimed may have used material from his book, but he found that difficult for works that retold his version of the Ellsworth incident. The only Western film based on a Wyatt Earp character to feature the heroic staredown with a Ben Thompson character was The Arizonian, filmed in 1935 from a script written by Dudley Nichols. The movie was released just a year after Frontier Marshal by Fox Studios, which had purchased the exclusive rights to Lake’s book. Historian Paul Andrew Hutton has speculated that Lake passed on an opportunity to sue Nichols because the Earp biographer had claimed the Ellsworth incident to be part of the historical record. His conclusion is supported by Lake’s reluctance to litigate two decades later when the Thompson showdown came up again. 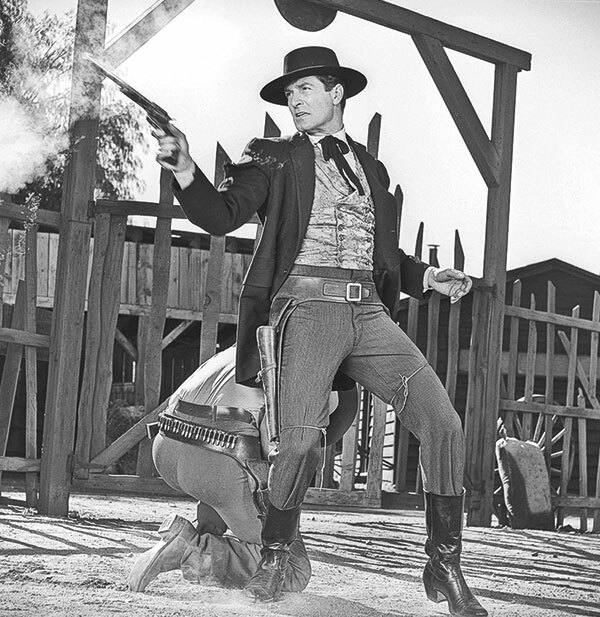 Stuart Lake was super irritated at not being chosen to introduce the episodes for the ABC series The Life and Legend of Wyatt Earp starring Hugh O’Brian (above). Perhaps the biographer believed he could be just as good as the “Old Ranger,” who used to introduce every episode of Death Valley Days. In 1953, Hollywood producer Robert F. Sisk wrote to Lake asking about the television rights for Frontier Marshal. Recognizing an opportunity to boost book sales, Lake agreed to a contract, although Sisk rebuffed his additional demands for final script approval and recurring on-camera introductions to each episode. Sisk allied with Louis F. Edelman as the executive producer for The Life and Legend of Wyatt Earp, and the pair began to line up the sponsors, talent and network contracts necessary to make the show a reality. Sisk secured the talents of Frederick Hazlitt Brennan, a scriptwriter with many screenplays to his credit, but he also wanted Lake to provide stand-alone narratives for each half hour episode. Once filming got underway, a magazine article appeared that threatened to scuttle the entire project. 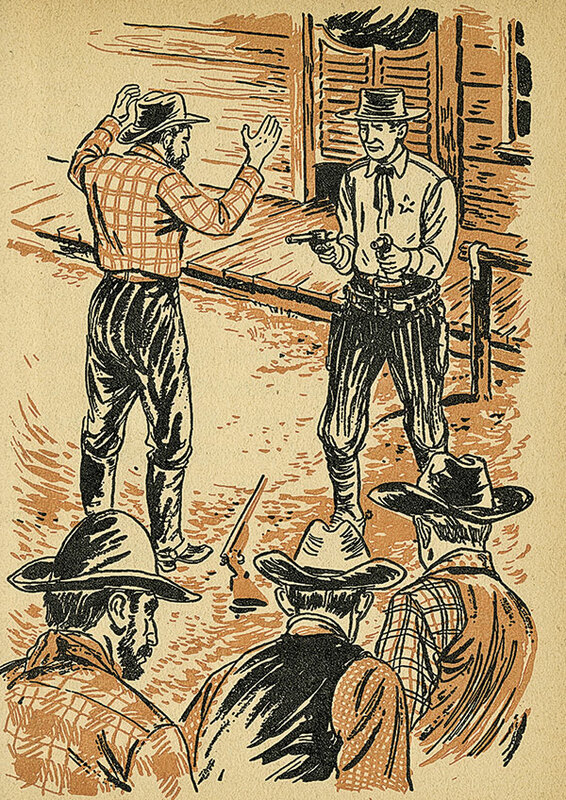 This Ellsworth Showdown illustration, from the only biography Stuart Lake authorized in 1956, was drawn by Robert Doremus for Philip Ketchum’s Wyatt Earp. It treads dangerously close to Hugh O’Brian’s look as the frontier lawman in the ABC series. In the summer of 1955, Argosy magazine came out with an expose written by Edwin V. Burkholder titled, “The Truth about Wyatt Earp.” Filled with the usual anti-Earp screed of previous debunkers, Burkholder also gave a fascinating spin on the Ellsworth incident, which must have hit close to home for ABC, as the pilot was going to feature the Ellsworth showdown. Burkholder reported Wyatt had actually participated in a con job by agreeing to publicly arrest Ben Thompson before the showdown. 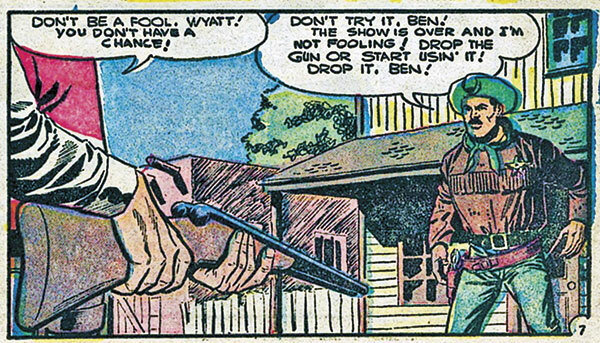 Wyatt was able to stare down the Texas gunman because he knew in advance Ben would not shoot. Intentionally or not, Burkholder had touched on the one “fact” that Lake could never deny without admitting the bankruptcy of his own version. One of the sponsors of the show, General Mills, expressed alarm about Burkholder’s story. Sisk demanded a detailed rebuttal from Lake. Instead of complying, the writer complained about his status for the show’s credits and urged the producers to just ignore the “silly” charges. Reminding Sisk, “if it were not for your Uncle Stuart, there would not be much of a series,” Lake insisted he be given story credit for the first episode in addition to the title of consultant. 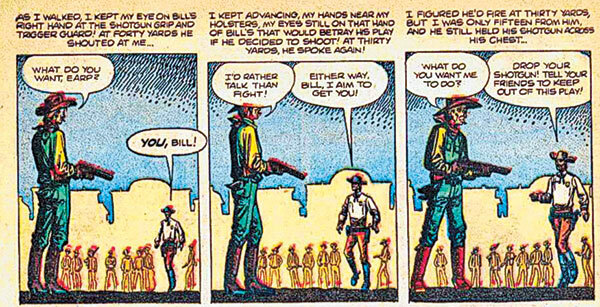 As a historical figure, Wyatt Earp could not be copyrighted, but Charlton Comics avoided an issue by depicting Earp with a mustache and a buckskin shirt in this Ellsworth Showdown from Wyatt Earp, Frontier Marshal published in January 1956. “Certainly, no one can dispute the fact that the Ellsworth business, barring a couple of twists, is right out of the book,” he argued, a sideways admission that the Thompson showdown came from his imagination alone. Curiously, in his urging of the producers to leave the Argosy story unanswered, Lake acknowledged that an 1884 account of the affair by Ben Thompson failed to mention Wyatt Earp, as if that omission somehow added to the proof of his own version. 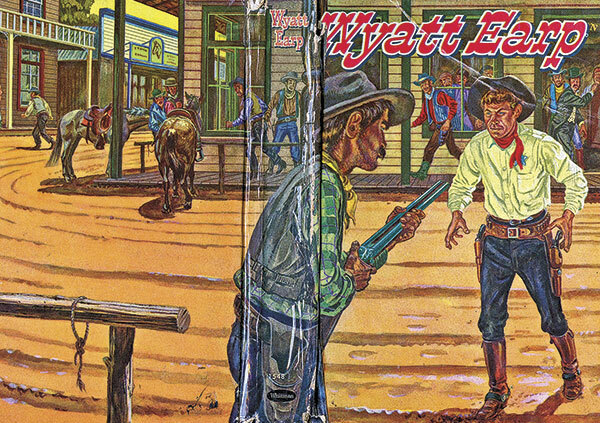 The first issue of Wyatt Earp, Frontier Fighter, published by Atlas Comics in November 1955, avoided a potential legal challenge by having Earp face down Bill Thompson, rather than his brother Ben. Still seeking a credible statement from his consultant to back up his rebuttal, Sisk again pressed Lake for a response. Lake wrote back about his ideas for manufacturing T-shirts and publishing a juvenile version of Frontier Marshal and a serialized Sunday newspaper comic strip. He again laughed off the Burkholder story. 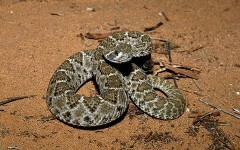 Sisk began to lose patience by the end of July. He reminded Lake that he needed a specific denunciation of the Argosy article. Lake again stalled, angry about his reduced role in the production of the Ellsworth episode, which he thought he would be introducing himself. After a lengthy complaint about being edged out of script approval, Lake grumbled that his response would be forthcoming. Another week passed before he addressed the issue, and in his letter, Lake spent most of his typewriter ribbon questioning the value of Argosy magazine in general and the questionable identity of Burkholder in particular. He suggested Sisk demand Argosy’s editors produce Burkholder in the flesh to document the article under oath. Lake smugly predicted Argosy would be unable to do so and bluffed, “I can document my biography of Wyatt Earp in every essential paragraph,” a bold claim for a book that failed to include a bibliography or even a single footnote. More than half of 1956’s The Picture Story of Wyatt Earp, by Felix Sutton and illustrated by Louis S. Glanzman, deals with a fictionalized version of the Ellsworth showdown. The Ellsworth story featured Hugh O’Brian’s Wyatt Earp bravely facing down a less-than-threatening Ben Thompson played by Denver Pyle. (Perhaps due to budget considerations, the supposed crowd of 100 backing Thompson was reduced to three.) The credits named Brennan for both the story and the script, a subtle indication of the growing strain between the producers and Lake. The Life and Legend of Wyatt Earp became a hit and enjoyed six years of particularly high viewer ratings, but Sisk and Edelman eventually refused to renew Lake’s contract. They also left him to challenge alone any histories of Wyatt that did not infringe on the show’s copyright. Professor Kim Allen Scott is the university archivist at Montana State University Library in Bozeman. 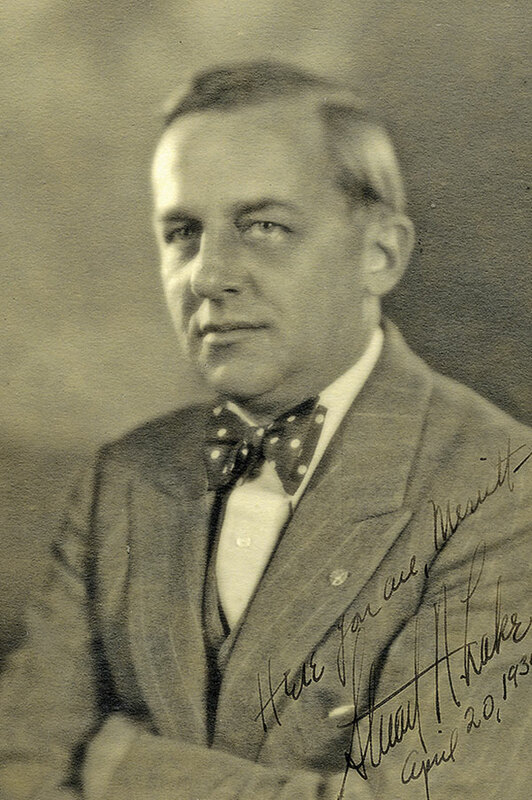 He discovered the letters between Stuart Lake and Robert F. Sisk in a mislabeled file folder that was part of the Frederick Hazlitt Brennan papers at UCLA. What book has the pictorial history of the Little Bighorn Battlefield?